The Meiji restoration in 1868 led to the overthrow of the Shogunate. From 1868, the newly formed Meiji government continued with reforms to centralize and modernize Japan. The Boshin war started soon. Although the Tokugawa shogunate had been overthrown, tensions between the former ruler and the restoration leaders led to the war. Enomoto Takeaki, admiral of the Shogun’s navy, also refused to surrender all his ships, remitting just four ships, and escaped to northern Honshū with the remnants of the Shogun’s Navy, which were eight steam warships and 2,000 men. 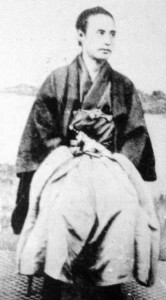 Following defeat of resistance on Honshū, Enomoto Takeaki later fled to Hokkaidō where he established the breakaway Republic of Ezo. A military force was dispatched by the new government to defeat the rebels culminated with the Naval Battle of Hakodate in 1869. The French-built ironclad Kotetsu, originally ordered by the Tokugawa shogunate, was received by the Imperial side and was used decisively towards the end of the conflict. 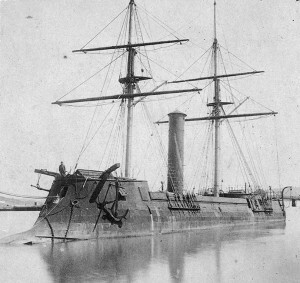 Kōtetsu, Japan’s first ironclad warship, as CSS Stonewall c. 1865. The Kotetsu ship had an extraordinary service life with many countries involved before finally it was commissioned by Japan. On January 6, 1865 the vessel took on a Confederate crew at Copenhagen and was recommissioned the CSS Stonewall while still at sea. The arrival of the “formidable” Stonewall in America was dreaded by the Union, and several ships tried to sink her. Stonewall sprang a leak, however, after leaving Quiberon, Brittany and Captain Page steamed her into Spain for repairs. On March 24 Captain Page steamed the Stonewall out to sea, challenging the U.S. Navy vessels, which turned and fled, fearful of engaging the ironclad. After realizing that the enemy ships had departure, Captain Page steamed for Lisbon. It was planned to cross the Atlantic Ocean. There, the plan consisted in a surprise attack at Port Royal, which was a major base of Major General Sherman on South Carolina. The ship reached Nassau on May 6, and then sailed on to Havana, Cuba. During this stay, the Captain Page learned of the war’s end. There he decided to sell her to the Spanish Captain General of Cuba. The vessel was then turned over to United States authorities in return for reimbursement of the same amount. She was temporarily de-commissioned, stationed at a U.S. Navy dock, until she was offered for sale to the Japanese government of the Tokugawa shogunate. Therefore, France, Confederates, Spain, Union and Japan were the countries which operate the ship. In the following months after 1868, military forces of the government were put under several organizations which were created and then disbanded until the creation of the establishment of Ministry of Military Affairs (Hyōbushō). The Army Ministry would be created created in April 1872, along with the Navy Ministry, to later replace the Ministry of the Military (兵部省 Hyōbushō) of the early Meiji government. For the first two years of the Meiji state no national, centrally controlled navy existed, the Meiji government only administered those Tokugawa vessels captured from the early phase of the Boshin war.All other naval vessels remained under the control of the various domains which had been acquired during the bakumatsu period. The naval forces mirrored that of the political environment of Japan at the time in which the domains retained their political as well as military independence from the imperial government. Katsu Kaishu a former Tokugawa navy leader was brought into the government because of his naval experience and his ability to control Tokugawa personnel who retained positions in the government naval forces. Upon assuming office Katsu Kaishu recommended the rapid centralization of all naval forces government and domain under one agency. The incident involving Enomoto Takeakis’ refusal to surrender and his escape to Hokkaidō with a large part of former Tokugawa Navy’s best warships embarrassed the Meiji government politically. The imperial side had to rely on considerable naval assistance from the most powerful domains as the government did not have enough naval power to put down the rebellion on its own. In 1871 the domains were abolished altogether and as with the political context the centralization of the navy began with the domains donating their forces to the central government. As a result in 1871 Japan could finally boast a centrally controlled navy, this was also the institutional beginning of the Imperial Japanese Navy. Soon in February 1872, the Ministry of Military Affairs was replaced by a separate Army Ministry and Navy Ministry. 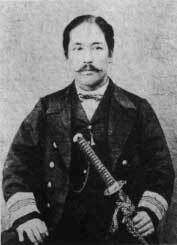 In October 1873, Katsu Kaishu became the first Navy Minister.